Allan Ramsay and George III are as inextricably linked as any British monarch and artist in the eighteenth century. The King, the most active patron of the arts since Charles I, has come to be defined by Ramsay’s portraits almost as much as Charles I was by Van Dyck. Similarly, Ramsey’s practice came to be dominated by the many various portraits of George, for which there was an enormous demand throughout his career. Ramsay first painted George in 1757, before he became King, through the influence of his leading patron, the prime minister Lord Bute. The Prince evidently enjoyed being painted by the Scot, who, uniquely for an artist at court, could speak German, and gave him the prime commission of his coronation portrait of 1761. At the time this generated considerable political comment, and was thought another instance of excessive Scottish control at court, for the then Principal Painter to the King, the generally forgettable John Shackleton, should by rights have been given the job. But the quality of Ramsay’s paintings soon quelled any adverse comment. They are generally held to be the finest full-length royal portraits since Van Dyck’s depiction of Charles I. Ramsay was appointed Principal Painter to the King immediately after Shackleton’s death, and throughout his career painted, with his studio, about 150 pairs of portraits of George III and Queen Charlotte. 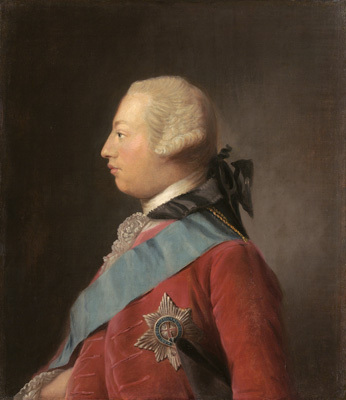 Ramsay also painted, in about 1761-2, a profile portrait of the King ‘for’, as Ramsay wrote ‘the coinage’. Far fewer versions of this portrait exist, with only four recorded in Alastair Smart’s catalogue of Ramsay’s works. The prime version was commissioned by the Earl of Bute. The present work, done in Ramsay’s studio under his supervision, may be that sold by the art dealer Horatio Rodd in 1827.